Footprints is a Christian sculpture by master artist Timothy P. Schmalz inspired by the poem “Footprints In The Sand”. 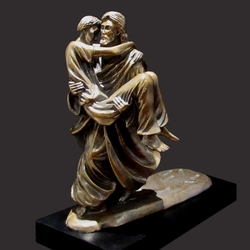 Timothy has captured that moment where Christ carries us through our troubled times. It is a perfect symbol of how Christ is always there to help us. Mr. Schmalz's small statues are miniature versions of his large masterpieces. These small religious sculptures are works of the highest quality and make excellent Christian Gifts that will be treasured forever. This solid resin-stone cast is coated in a realistic bronze finish and is mounted on a solid matt black base.